ST AUGUSTINE, Trinidad, June 1, 2013: Simon Blake and St Lucian Joseph Clercent shared 50 points between themselves as Toco Youths made certain a new champion will be crowned in the Men’s Division of the Caribbean Volleyball League after outlasting last year’s winner, Glamorgan, 25-21, 21-25, 25-23, 23-25, 15-12 in their semifinal at the University of the West Indies, Sports and Physical Educational Centre (UWI SPEC), St Augustine, on Saturday. Going into the match, Glamorgan was confident of reaching the championship match after easing past Toco Youths, 25-17, 25-18, 25-17 in their round-robin opener. However, Blake and Clercent had other ideas and tallied 26 (24 kills) and 24 (22 kills) points respectively in the match which last five minutes under two hours. Puerto Rican, Pablo Guzman added 15 valuable points for tournament newcomers, Toco which dominated its opponents 67-46 on spikes, 9-7 on blocks and 5-3 on service aces to overcome its 50 points handed to Glamorgan on errors. For Glamorgan, Bahamian Byron Ferguson had 17 points, Ryan Stewart added 16 and USA’s Jordan Du Fault, ten. 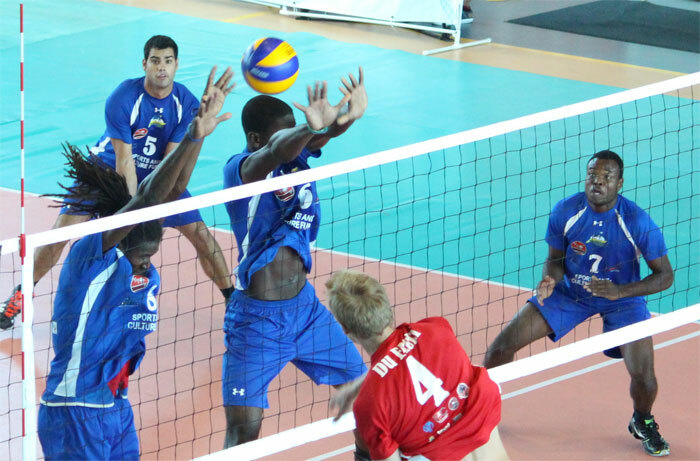 In the final, Toco Youths will meet last year’s runner-up Technocrats which overcame BIG South East Port-of-Spain 26-24, 25-19, 20-25, 25-21 in one hour, 40 minutes led by the top trio in, Dominican Republic’s Jose Caceres and Elvis Contreras, and Portugal-based T&T professional, Marc-Anthony Honore. Caceres ended with 24 points, inclusive of 20 kills and four blocks while Contreras had 12 kills, four blocks and seven aces in his 23 points and Honore, nine as they outscored SEPoS on spikes, 48-42, 13-8 on blocks and 8-5 on service aces to have a chance at claiming the winner-take-all US$5,000 top prize. Suriname’s Keven Sporkslede had a team-high 20 points while his countryman Gino Naarden got 11 and T&T’s Akim Bushe, ten. Technocrats will now face Toco Youths in Sunday’s final from 6pm while Glamorgan and SEPoS meet in the bronze match from 2pm.